If there were any doubts that the euphoria following Cyril Ramaphosa’s election as president of South Africa has evaporated, this week’s slump in the rand has removed them. The currency has plunged to a level last seen when Jacob Zuma was still in charge, having retreated from a three-year high against the dollar amid a toxic cocktail of negative economic news, political risks and falling commodity prices. An investor retreat from emerging markets has accelerated its slide of almost 10% against the dollar this month. When Ramaphosa took over as president in February, he promised to stimulate growth and attract investment, fix the finances of state-owned enterprises, and root out the corruption that marked Zuma’s administration. Investors took note: the rand surged to a three-year high in February and borrowing costs fell as inflows into the country’s bonds and stocks surged. The mood was dubbed “Ramaphoria”. There’s no sign of it now. “The change in the political leadership after Cyril Ramaphosa took power provided a boost to investor sentiment, sparking a rally in the rand that has now been reversed,” Mark Bohlund, an Africa economist at Bloomberg Economics, wrote in a report. The economy contracted in the first quarter as the current-account deficit widened, highlighting the country’s vulnerability to capital outflows. Mining production, once the engine of the economy, has slumped, and manufacturing and consumer spending have struggled to pick up the slack. A widening budget gap has limited Ramaphosa’s ability to boost infrastructure and social spending. “South Africa faces domestic challenges at a time when the external backdrop is less positive for risky assets,” said Piotr Matys, a London-based emerging-market strategist at Rabobank. The rand dropped 2% on Wednesday to R14.52/$, before recovering ground to trade at R14.37 as of 8:25 on Thursday. It hit R15.55/$ on Monday, the weakest since June 2016. The cost of insuring the country’s debt against default for five years using credit-default swaps climbed 14 basis points to 219, the highest in more than a month. Moody’s Investors Service rates South Africa’s foreign and local debt at Baa3, the lowest investment level. Adding to the weakness, Naspers [JSE:NPN] , which accounts for 18% of the benchmark stock index, tumbled after China’s Tencent, in which it owns a 31% stake, missed earnings estimates. 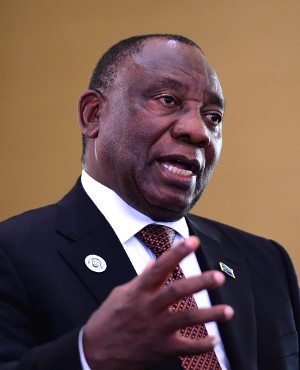 The tipping point came on August 1, when Ramaphosa, bending to the populist faction of his party, announced that he would seek a constitutional amendment to allow expropriation of land without compensation. The move could undermine property rights and deter investment, some analysts say. Investors are looking north to neighbouring Zimbabwe, where a program of violent land seizures beginning in the late 1990s wrecked the economy. Gwede Mantashe, chairperson of the governing African National Congress, stoked the concerns on Wednesday when he proposed that white farmers should be forced to turn over excess land to the government, handing traders another excuse to abandon the rand on a day that both Moody’s and Reserve Bank Governor Lesetja Kganyago sounded warnings on the economy. “Markets are sensitive to anything perceived to be ‘Zimbabwe-fication’ on the land-reform front,” said Henrik Gullberg, executive director of emerging-market strategy at Nomura International. The fact that Mantashe was just repeating proposals that had been made before “doesn’t really matter, especially in an environment of broader US dollar strength,” he said. The Emfuleni municipality, which is part of South Africa’s richest province, had all of its vehicles repossessed by Bidvest [JSE:BVT], civil society group the Organisation Undoing Tax Abuse said on Wednesday.